Extensive leaking from the top floor to the basement caused by multiple issues, including hail damage, sent the managers of this 109 year old building in downtown Oklahoma City looking for a solution. Gas Building in downtown Oklahoma City, Oklahoma was erected in 1904. Since then, the face of Oklahoma City has changed dramatically, but this building has remained standing strong throughout a few major renovations. 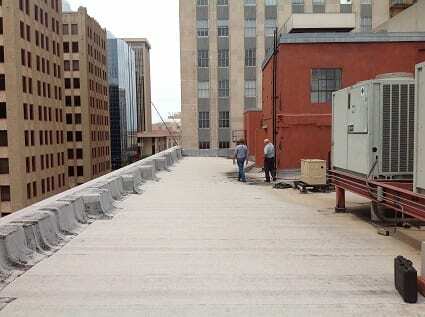 As is common in Oklahoma, a strong hail storm passed through and damaged the granulated cap sheet roof on this building that was already starting to see the end of its life and bring headaches to the tenants. For years, this roof had been leaking in multiple areas. The owner brought in Proformance Roofing Systems to find solutions to their extensive number of problems. In addition to poor drainage, a worn-out membrane that resulted in wet insulation, loose flashings, and extensive leaks, one of the walls of a penthouse building has had persistent leaks for years and a small section of roof in between this building and the parking garage next door had over one ton of pigeon droppings on it. After analyzing the extensive work that would need to be done to this roof system, the contractor provided the owner with the options. Since there are two existing roof systems, a single ply or cap sheet could not be installed directly over the existing and that would be an unwise system to recover with. The first option was a complete tear off down to the deck with an entirely new system. The cost of this was alarming. In addition to the high cost, it would be very disruptive to the top floor tenants. The other option was a fluid applied membrane installed directly over the existing roof after all necessary repairs to the existing system were made. TRITOflex was chosen over any other fluid applied because it will withstand indefinite ponding water, is environmentally safe, has 1900% elongation, could be sprayed to an 80 mil thickness in one coat, and carries FM approval for Severe Hail and the highest wind uplift rating in the industry. This option was cost effective and non disruptive and became an easy choice for the client. After putting together a plan of attack, the crew started digging in, which included removing all of the pigeon droppings from just 500 sf area of roof that filled over 40 industrial-sized contractor trash bags. They removed existing sections of roof that had saturated insulation and replaced with new insulation and peel-and-stick cap sheet, re-sloped areas for water to drain properly, fixed HVAC drainage pipes, installed new one-way vents, and repaired loose flashings in the existing system. After all of the extensive repair and prep work was done, they quickly installed the TRITOflex membrane at 80 dry mils with a 20 mil dry top coat of TRITOtherm to provide an important sacrificial layer to prevent membrane degradation and also provide the client with extreme monthly energy savings. 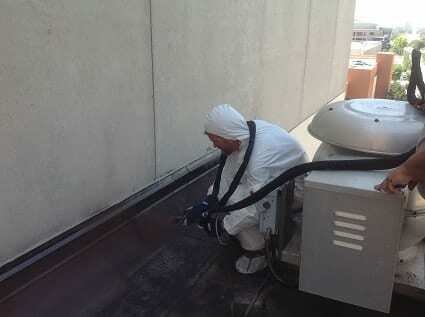 The wall of the center penthouse that had been leaking constantly was also sprayed and sealed with TRITOflex and re-painted to match its original color. The client ended up with an initial 15 year warranty that can be extended another 10 years, all the way up to 35 years, with an inspection and recoat of TRITOtherm. In the hail, wind, and storm alley of Oklahoma, the TRITOflex roof system is a perfect fit to protect the tenants of this building and their daily operations from the constant interruption of leaks.